Gareth Brookes is a graphic novelist, print maker, textile artist, small press publisher, enthusiastic home brewer, and gentleman poet. He graduated in Fine Art Printmaking at the RCA. 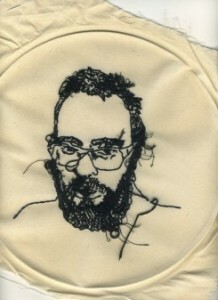 He creates weird, humorous and experimental graphic novels and handmade comics utilizing unusual materials such as embroidery, pressed flowers and fire. In 2012 he won the First Graphic Novel Prize, and his graphic novel The Black Project was published by Myriad Editions in 2013. His latest book, A Thousand Coloured Castles is also published by Myriad. Gareth also runs workshops in linocut and monoprint printmaking and aspects of comics and graphic novel practice at colleges, shops, book fairs and festivals. If you would like this to happen in your vicinity get in touch with him through his website at www.gbrookes.com, where you can also find out more about Gareth and his work.